HIGH PRICED SPREADS: You never know where this blog will go, especially in the face of last summer’s strawberry shortcake season. 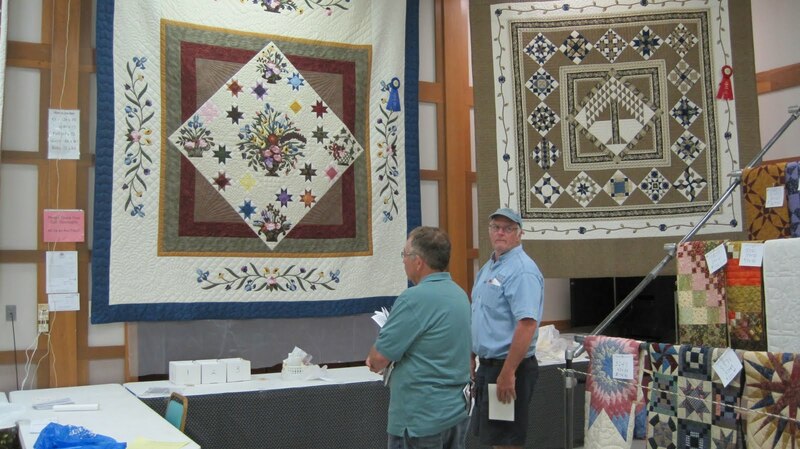 Here I am standing in front of the 2011 First Place Quilt (see blue ribbon in upper right of photo) at the annual (July) Kutztown Folk Festival in Pennsylvania. Everything you see here was hand stitched by American fingers and the winner fetched $10,000 for her effort. An entire barn was filled with quilts. As far as I’m concerned www.kutztownfestival.com is the Super bowl of Americana, especially if you’re a quilter. Works displayed span not only the Amish community but the entire Pennsylvania Dutch region. If you hurry, quilts make a great holiday gift. In nearby Lancaster, PA, John and Arlene Volz’s www.amishcountrylanes.com/ sell and ship quilts and other handcrafts year-around, including those one-of-a-kind quilts that are perfect (and often lower priced) for those long San Diego winters. Top Photo by Phyllis Shess. 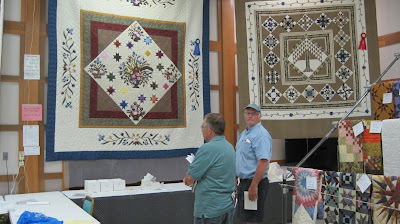 Shows prize winning quilt that auctioned off at $10,000. Yikes! But quilts on the rack (right) were all under $200. That’s Kutztown Exec. Director on Dave Fooks (right).